Richmond (Badasses: The Legend of Snake, Foo, Dr. Death, and John Madden's Oakland Raiders, 2010, etc.) examines how the legendary coach’s search for spiritual truths may have served as the blueprint for his future coaching success. By NBA standards, Jackson was an eccentric. In college, he majored in philosophy, psychology and religion, and he stood apart from his New York Knicks teammates as he referenced Camus and Sartre in interviews with beat reporters. His enlightenment extended throughout his adult life and NBA tenure. Richmond studies Jackson's entire career, including his seasons coaching the Albany Patroons of the Continental Basketball Association, a section that comprises too much of the book. 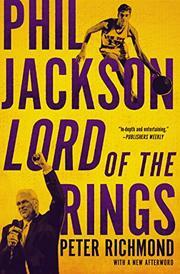 He recounts Jackson's well-known penchant for giving his NBA players reading assignments in an effort to familiarize them with his ideologies and help the 12 dissimilar individuals "coalesce and win.” It is worth noting that although Jackson won a record-breaking 11 championship titles with the Chicago Bulls and Los Angeles Lakers, he was named NBA coach of the year only once. Ironically, this may be due to his peers' opinion that his success was not due to his coaching ability; rather, he was lucky to coach superstar players and work alongside equally skilled general managers who created those teams. Ultimately, Richmond strains to represent Jackson's coaching methods as an outgrowth of his personal value system, particularly when he posits that Jackson's famed "triangle offense"—something of a free-form strategy that creates flow within the game and becomes instinctive—mirrors the three components of Buddhist philosophy, as well as Jackson's spiritual belief system, comprised of Christian, Zen and Buddhist doctrines. The book would have been more engaging as an oral history, weaving together stories and observations from Jackson's colleagues, teammates and friends. The narrative ends with the author no closer to validating his premise that Jackson's "Zen thing" has been the key to his success.